In order to make your mark on the world, you often have to make a voyage from the familiar into far off places where few have ventured or even dared. These journeys are necessary to discover our true selves and grow our knowledge of the world around us. We have developed a platform that will help you take that journey. A BOTE like no other, that will take you farther, faster than anything we have ever created. WE CALL IT ROVER! Rover’s modular Rac Receiver System allows you to configure your rover in a multitude of configurations by simply sliding the Rac of your choosing into the receiver in a matter of seconds. No tools required. The Moto Rac is the core feature of the Rover. It is the single accessory that makes the leap from paddle to power. By simply inserting the Moto Rac into the integrated receivers, your rover is ready to ride. The Moto Rac is engineered with 2 rod holders and two 1 gallon Rotopax™ mounts. A newly engineered feature for the Rover is the Grab Rac. Insert into any of the Rac Receivers to further enhance your adventure. Use it as support while running or as you move around the deck. Nylon molle loops are riveted to the marine grade aluminum risers to allow for multiple gear attachment points. The BVA foam hook caddy will keep your go-to flies and lures easily accessible. The most stable board we’ve ever created with a capacity up to 500 lbs, you can walk from rail to rail and nose to tail while maintaining complete control. Designed with your gear in mind, Rover has a place for everything. 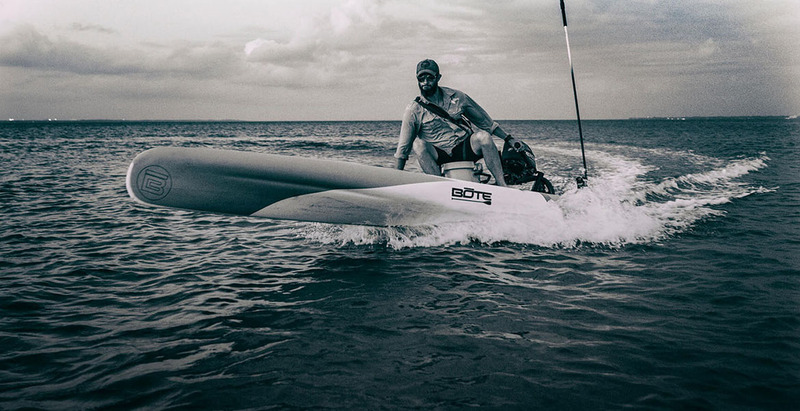 Connect all your accessories: cameras, straps, coolers, GPS, fish finders, smart phones, PFD’s, or whatever you can imagine with this simple solution that has reinvented the way we connect to our sport. Installed throughout the Rover’s deck, the ConnexSUP plugs are inspired by the need for a simple solution to mounting an overwhelming number of accessories being offered in the marketplace. The system is made of ballistic strength reinforced injection molded polycarbonate and uses a universal base that hosts any number of attachments that allow you to fully customize your Rover and get the most out of your equipment. With an extremely shallow draft, the Rover can practically float in spit. Requiring only inches of water you can access places no regular boat would dare venture. 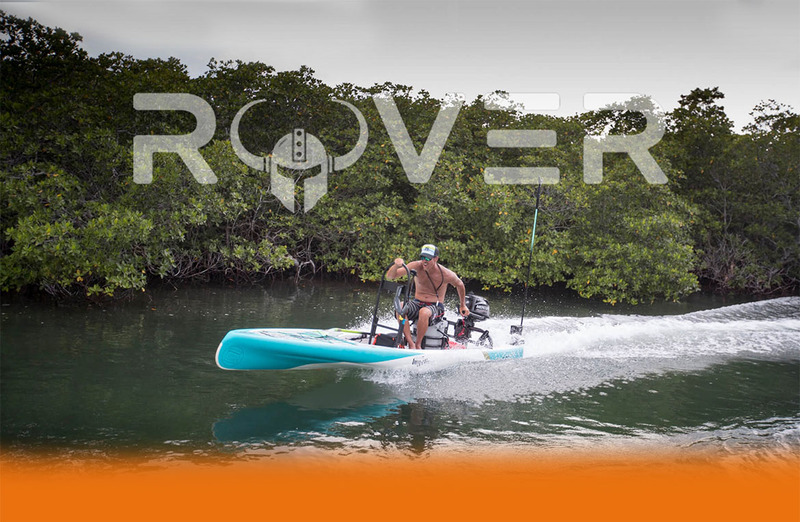 With a recommended maximum 6 HP Four Stroke outboard, Rover will run like a scalded dog reaching speeds of 16 miles per hour getting you where you want to be faster than any BOTE we’ve ever made. 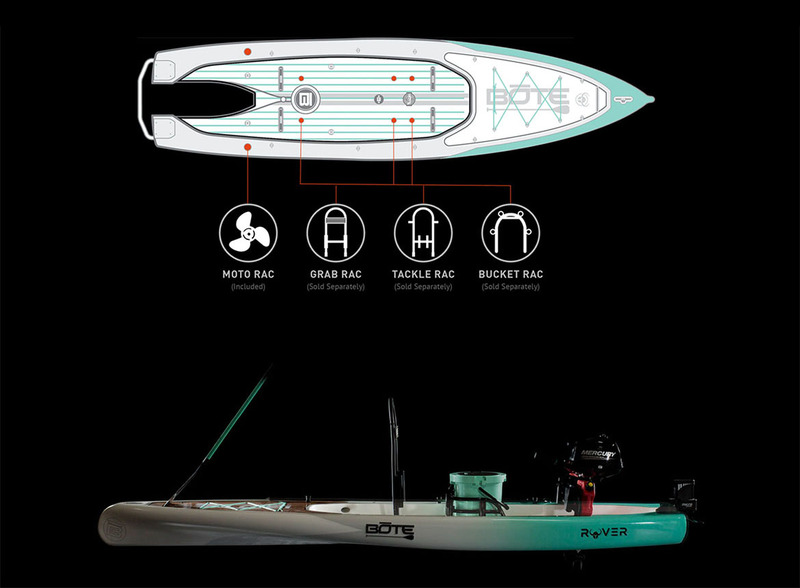 Rover has benefited from BOTE’s years of experience as a leading innovator of paddle craft and features a channeled, Deep-V nose design to efficiently slice through the water. The included Carbon/Fiberglass Axe Edge Adjustable Paddle–one of the lightest, strongest adjustable paddles on the market–allows you to paddle further with less fatigue. 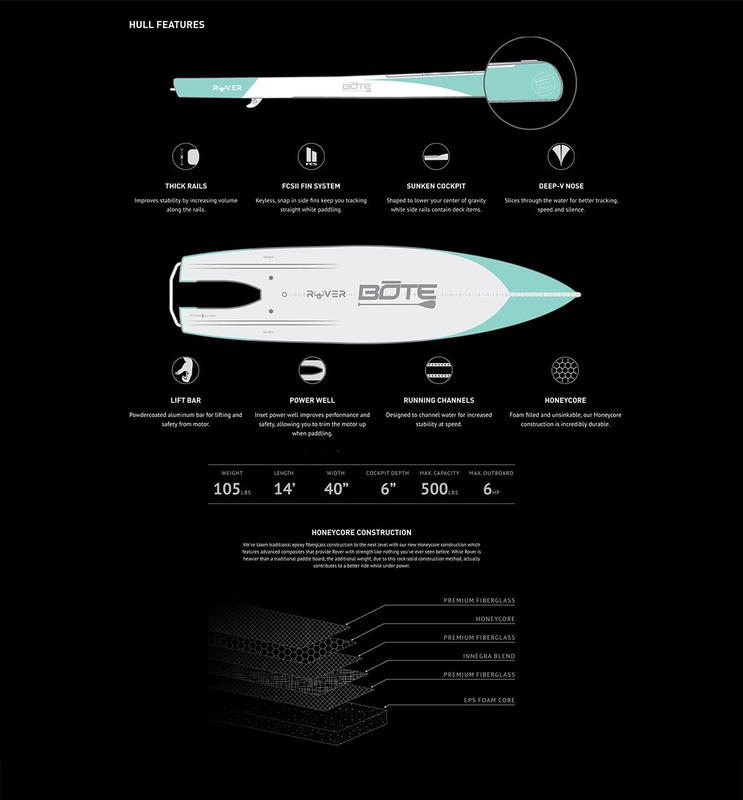 Equipped with a Paddle Sheath in the nose of the board, quickly sheath your paddle to free up your hands for casting or taking a sip of that cold one. The foot end of our optional Sands pear shallow water anchor is the perfect push pole getting you silently through the even the most shallow waterways without making a peep. And when you’re in position, drive the spike end into one of the through holes in the deck of the board to stop on a dime and hold position while you cast. When not in use, lash the Sandspear to the deck using the included Lash Points or wedge it between the optional Vertebre rail attachments. The Power Pole® Micro™ wireless shallow water anchor system is a fisherman’s best friend. 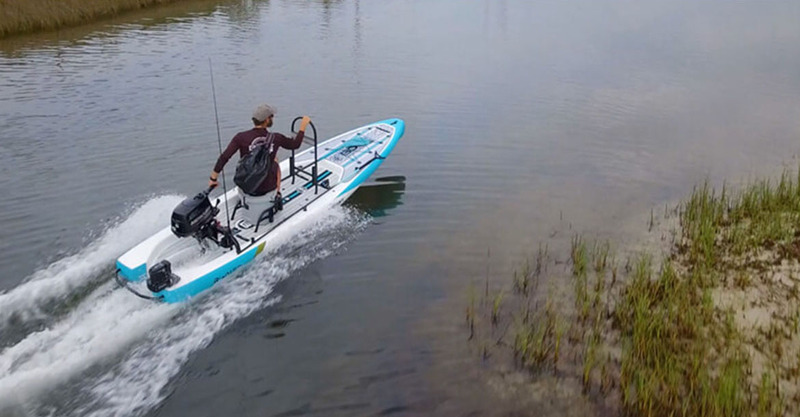 Slide up on your fishing spot in dead silence and use the anchor to keep your position regardless of current or wind. Rover has mounting points for the Micro™ on both sides of the board. BOTE’s Sandspear is interchangeable with the Power-Pole® Micro™ anchor. When it comes to transporting your Rover, you’ve got options. Not only does it fit in your garage, but you can load it in the back of your truck, load it on roof racksor tow it with a trailer. Wheel Racs will get Rover from truck to shore with ease. Get Yours Today From Nautical Ventures In Palm Beach, Riviera Beach, & Broward!